My fingers have been itching to blog about my experience at the South Texas Innovative Medicine clinic. I still can’t believe that I journeyed there by myself without the sturdy hand of my husband keeping my anxiety at bay on the airplane…yet, in a way, I can believe it, because the Kingdom of God is IN me. Jesus’ strong hands carried me through the week. And although I was lonely, I was never alone. On my first day to the clinic, I underwent various tests. X-rays of my feet and ankles showed obvious darker areas where the bone was thinning (I later learned this was due to lack of adequate circulation in my feet). The nurse took the temperature of my toes and my fingers. My husband wouldn’t be surprised to learn that my toes were only 70 degrees since he has to endure my night-time attempts to warm them up on him, but I didn’t realize they were THAT cold. The clinic measured the rate of blood flow through my toes and checked to make sure that I was getting adequate circulation to my feet from my heart — I was. But there was a disconnect from the artery in my ankle to my toes…the blood was traveling well on the highways (arteries), but it wasn’t moving along the smaller roads in the suburbs of my feet (smaller capillaries). The doctors took an extensive history of my symptoms and told me that I was a “classic” case of a person who has an autonomic nervous system dysfunction. Dr. Rhodes told me that “fibromyalgia” is a term that many doctors use to describe a series of symptoms that they don’t know how to treat but that are somehow related. What these symptoms have in common is the failure of the autonomic nervous system to regulate adequate blood flow to all parts of the body. The autonomic nervous system controls all the non-conscious body actions, such as digestion, heart rate, respiration, and the control of blood flow through arteries, veins, and capillaries. These functions are regulated by several neurotransmitters. It may help to visualize them as parts of a big pot of stew that is made up of three main ingredients. First, let’s consider one of the most important. Fittingly, its abbreviation is VIP (for Very Important Peptide, joked Dr. Rhodes). Vasoactive intestinal peptide, or VIP, is a neuropeptide that controls the body’s autonomic functions, including the circulatory system. A google check of VIP unleashes scores of studies on this peptide. Common to these studies is the fact that a lack of VIP levels in the blood serum levels of patients corresponds to a host of symptoms and diseases, such as asthma (which I’ve also developed as an adult). Nerves in the body produce VIP. Adequate VIP in the body means the body organs are receiving enough oxygen. A drop in VIP means body organs are not getting enough oxygen. What happens when we don’t get enough oxygen? Right. Our cells can’t function properly. But VIP does not act alone. It is controlled by another peptide, calcitonin gene-related peptide, CGRP, which is also produced by the nervous system. A highly technical explanation on the relationship between CGRP and fibromyalgia can be found here, but for simplicity’s sake, I will try to explain their interaction as I understand it. Another neurologic player in our stew is given the uninteresting name of Substance P. Think: P for Pain. Substance P is a neurotransmitter that relays pain information to the central nervous system. It is also produced by the nerves. Now let’s put our fibromyalgia stew together. CGRP regulates VIP levels in our bodies. When we experience pain, Substance P destroys CGRP. If there’s not enough CGRP, there’s subsequently not enough VIP. Without enough VIP over a long period of time, we experience pain…which destroys more CGRP, which creates even less VIP…and the cycle continues. How to stop it is the million dollar question, and I have to say that I believe Dr. Rhodes is the Da Vinci of modern medicine in his approach to these pain diseases as well as other autonomic system disorders. Rather than find pharmaceutical ways to break the cycle, Dr. Rhodes wanted to find a way to induce the body to heal itself. A doctor wanted to find out why acupuncture, used for centuries in Eastern medical practices, worked. This doctor drew a blood sample before and after acupuncture and found that the sample taken after the acupuncture treatment had a higher level of VIP than the one taken before the treatment. What Dr. Rhodes has done is join Eastern acupuncture, acupressure, and reflexology practices to Western medicine and technology. 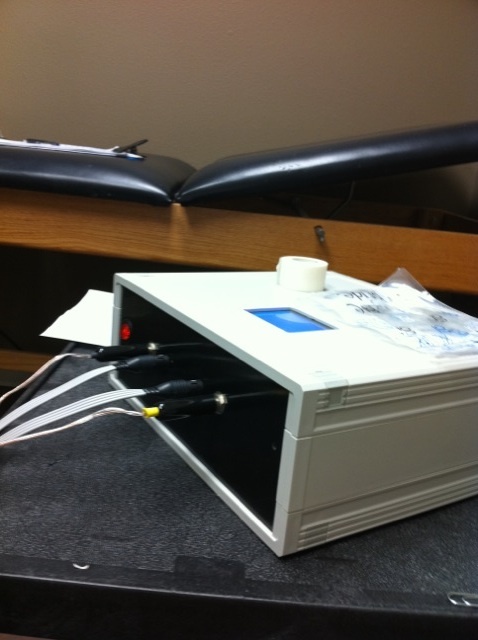 is attached to electrodes that stimulate nerves utilizing known acupressure, acupuncture, and reflexology points that are used to treat the different symptoms. 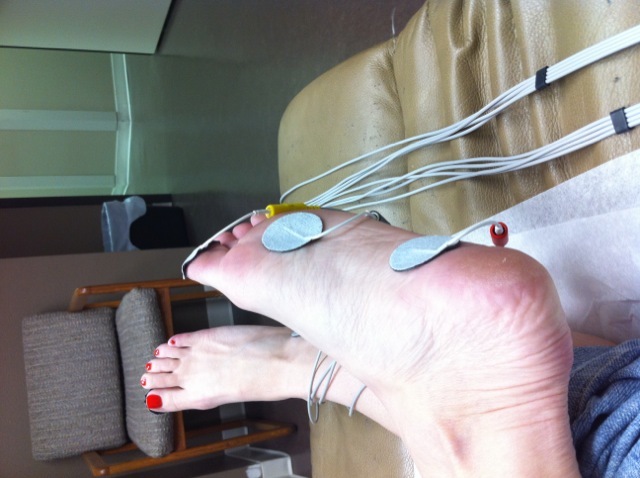 And here’s a photo of my lovely feet with electrodes attached. The machine is also connected by wire thermistors which constantly keep tabs of the temperature of my index fingers. This is because skin temperature is a direct indicator of the amount of VIP in a person’s body due to the increased level of circulation that occurs when VIP production is high. The results after six and a half days of treatment are very promising! First of all, my hand temperature has increased from the high seventies to the low nineties…a significant improvement that indicates my body is ramping up production of VIP. Specifically related to pain, I can say that my back pain is definitely LESS than it has been recently, and after using the machine the carpal tunnel pain I developed in my left wrist disappeared completely. I started getting a headache just before I did a treatment today and opted to NOT take a Tylenol. I wanted to see what would happen…here it is several hours after the treatment, and I have no headache. It went away. I won’t know if it counters endometriosis and period pain until later on, but due to these beginning results, I am hopeful! And so grateful to the Lord for opening the door to this alternative treatment to me! However, there have been other benefits that are not pain related but that also have to do with my nervous system. Readers of my blog know that I hate flying and long car trips because I get motion sickness. What you may not know is that even IMAX and 3-D movies make me ill to the point where I avoid them completely. Ever been in a glass elevator? Somehow the sensation of moving up or down and watching the ground move closer or farther away makes me so dizzy and disoriented that I literally fall against the wall. I can not stand up straight and watch. My coping mechanism for this problem has been to close my eyes. Watching out the window of an airplane while the pilot makes a turn also disorients me and makes me feel as if I am going to fall. Except not anymore! After just two treatments, I noticed in the hotel that I could actually keep my eyes open as the glass elevator moved up and down to my floor. The dizziness was gone. This is NOT a placebo effect in that I had no idea that doing the treatments would help something that has become such a large part of who I am that I don’t even question it. It was a completely unexpected, and very welcomed, consequence! Even better is the fact that as I flew home, I was able to watch out the window when the pilot banked the plane as he prepared for landing…when, in fact, that very same action on the plane trip TO Corpus Christi left me feeling very dizzy. Another benefit has been sleep. The treatments have no side effect except sleepiness. For the plane trip home, the doctor prescribed a certain configuration for anxiety that made the trip home much less stressful than the one to Corpus. After I complete a treatment at bedtime, I feel loose jointed and relaxed. An internet search linked these neurotransmitters, CGRP and VIP, to the sleep cycle as well. What differentiates Dr. Rhodes from other physicians I’ve seen in my health odyssey (except my primary care physician who supported my decision to try Dr. Rhodes’ treatment) is his willingness to see how interconnected the body really is. Whereas all these specialists concentrated on their area of expertise, Dr. Rhodes sees how they are linked and then has a plan to break the cycle of pain. I don’t expect a total absence of pain when my next cycle hits. Frankly, I am still shaking in my boots for fear of a repeat of last month’s pain that was a 10 on the Richter Scale. But the benefits I have felt so far, and the research I have done about these neurotransmitters and the nature of pain tell me that Dr. Rhodes is on to something. So is the fact that he has successfully treated many patients with endometriosis and fibromyalgia. If you are reading this blog and suffer from pain and wonder how you could try this treatment, currently the only way to do so is through visiting his clinic because his machine is not yet FDA-approved. Clinical trials are underway for a variety of diseases, and he expects to get FDA-approval at the beginning of next year. When this happens, your doctor will be able to be trained in the use of the therapy and can prescribe it for you. I really believe the future of medicine as we know it is about to change. I would prefer that my body learn to heal itself than to rely on narcotics and synthetic neurotransmitters and/or surgery, if at all possible! After all, we are beautifully and wonderfully made by our Creator. Our bodies beat off viruses, bacterial infections, and other critters that get in and try to do us harm. Our skin is a magnificent barrier to germs, and our other systems work together like a finely tuned machine. It makes sense that if we can find ways to deliver more oxygen to our tissues, they will be able to begin healing themselves. An entire new field of medicine can be opened as researchers explore the relationship of VIP on various diseases, such as asthma, and of CGRP, such as migraine headaches and Alzheimer’s disease. Western medicine tends to look upon Eastern practices as witchcraft and voodoo…but those in the know need to step back and take a humble pill. It wasn’t so long ago that western medical providers sold snake oil in the back of a wagon. Eastern medicine has used acupuncture, acupressure and reflexology for centuries. Snake oil never did catch on…because it didn’t work…whereas the Eastern practices are still around and are becoming more and more mainstream even in our Western culture….because they ARE effective and they treat the underlying cause (lack of VIP) rather than just mask symptoms. Dr. Rhodes and his contemporaries have hit on WHY it works and have married the ancient practices to modern technology. My warm fingers testify that at least in terms of better circulation, he’s on to something big. One day soon, I hope to stand witness that the Lord used Dr. Rhodes’ innovations to stop my pain in its tracks. Um, yea! And praise God!